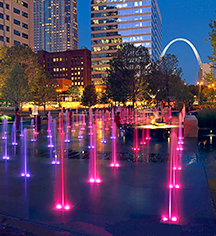 Located in the heart of downtown St. Louis, Missouri in the historic building of the former Merchant Laclède National Bank, the Hilton St. Louis Downtown at the Arch hotel offers easy access to the city center and a variety of local attractions. Visit the Gateway Arch and enjoy twilight walking tours on the Arch grounds or a variety of special riverboat cruises less than one mile away. 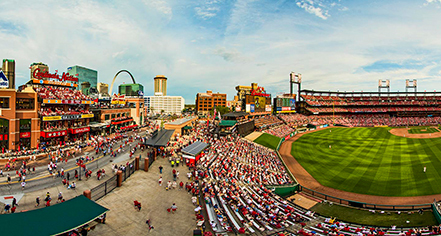 Discover fantastic shopping, dining, and entertainment opportunities in the St. Louis city center, or visit Busch Stadium, home of the St. Louis Cardinals of the MLB. Visit Edward Jones Dome, home of the St. Louis Rams of the NFL, or spend the day at the St. Louis Zoo. Discover St. Louis' colorful history at Laclède's Landing, offering a collection of cobblestone streets and vintage warehouses dating from 1850. Enjoy a show at Fox Theater, known as 'The Fabulous Fox,' located just three miles from the Hilton St Louis Downtown hotel, or enjoy a relaxing stroll in St. Louis' beautiful Forest Park.